Yesterday – Saturday 5 April 2014 – I had the privilege of watching England beat Montenegro 9-0 in their FIFA Women’s World Cup qualifier at Brighton’s Amex Community Stadium. It was an exceptional match, full of entertaining and skillful football, played in a spirit of friendship and good humour. Despite the appearance of the scoreline, Montenegro tried hard, with some very effective players, all the more remarkable as their women’s side has only been competing internationally for two years. 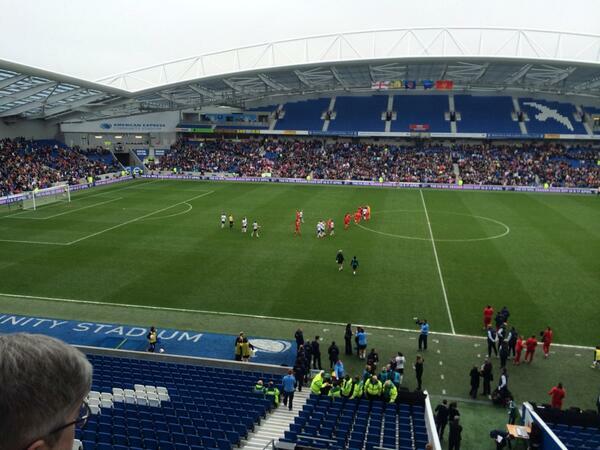 The sadness for me was that even with remarkably cheap ticket prices (£5 for adults, £2.50 for concessions), the match attendance was only 8,900, filling a little over a third of the seats in the Amex. Admittedly it was also being covered live on BBC2 and I look forward to learning the viewing figures. But it begs the question, why aren’t these first class international matches attracting the crowds they could? Particularly so when women’s football in the Olympic Games was very popular, with matches almost filling Wembley Stadium. What has happened to those crowds? Why don’t they come to watch England play, let alone the same players in the FA Women’s Super League? The answer is, to my mind, twofold – culture and investment, the latter probably being a follow-on from the former. The culture of football, and sport generally, is heavily influenced by the press and broadcasters. The British media still don’t regard women’s football – or any women’s sport for that matter – as seriously as they do men’s. In today’s Sunday Times if you were looking for mention of England Women’s victory, you had to wait until page 6 of the Sport section to find – at the bottom of the page – a few hundred words and a small picture of hat-trick scoring Toni Duggan. Now imagine if the England men’s first team had scored such a remarkable victory. Would that have been on page six? No, of course not. It would have occupied two or three pages of the Sports section and probably have been splashed across the front page of the main newspaper as well. It really is time for this outrageous gender bias in sport coverage to be challenged and to change. But for the media to change their approach to women’s sport, other factors need to change too, not least the way in which national governing bodies demonstrate their commitment to diversity. In 2012, the FA published Game Changer its plan for women’s football 2013-18. This ambitious plan says all the right things and I have absolute faith in its author, the Director of National Game and Women’s Football, Kelly Simmons, ably supported by Head of Women’s Development, Rachel Pavlou, and Head of Women’s Leagues and Competitions, Katie Brazier. What I have less faith in is the FA’s financial investment in the women’s game compared to the men’s. For example, how much was the marketing budget for yesterday’s match? Surely, with a bit more money and imagination, Brighton – known for its liberal culture and diverse population – could have produced more than 8,900 folk in the crowd? Part of the difficulty though is that the FA’s own stakeholders aren’t overly enthused by women’s football. Even now I’m told that not all 92 professional clubs support women’s and girls’ football through their development activities, let alone have a women’s side bearing the club’s name. Of those that do, far too few invest any serious money in their women’s team, though slowly but surely this appears to be changing with at least Liverpool and Manchester City joining Arsenal in committing proper funding this season. At grassroots level there remain institutional barriers to promoting gender (or any other form of) equality. The leadership of most county FAs is male, pale, and stale and that is then reflected in the membership of the FA’s ruling Council which has only four women out of its over 100 members. I’m pleased that, through my roles in the FA Inclusion Board and the London County FA, I may have the opportunity to have some influence on changing the culture that undervalues women’s football and the role that women themselves can play in governing our national game. I’m passionate about the vision of Football for Everyone. Now let’s make it a reality. Edward Lord is a member of the Football Association’s Inclusion Advisory Board and Chair of the London FA Inclusion Advisory Group, writing in a personal capacity. ← See It. Hear It. Report It. FA films help rid football of discrimination.